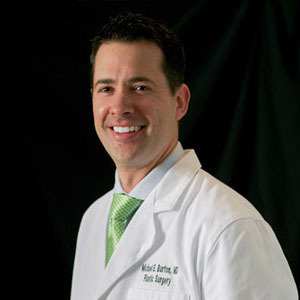 Michael Burton is a Plastic Surgeon with an emphasis on cosmetic surgery of the face, breasts, and body. He earned his medical degree at The George Washington University in Washington, D.C. and completed his General Surgery and Plastic Surgery training at the highly sought after Michigan State University program in Grand Rapids, Michigan. There he trained with many leaders in the field of Plastic Surgery including world renowned breast surgeon, Dr. Dennis Hammond. Dr. Burton has published papers in various plastic surgery journals including the prestigious Plastic and Reconstructive Surgery Journal. He has also presented his research at both regional and national meetings. He has participated in multiple volunteer surgical missions with Operation Smile including trips to India and Nicaragua. There he treated children with cleft lip and palate deformities who lacked access to specialized surgical care. Dr. Burton obtained a degree in Fine Arts, Painting and Drawing. During his training he had a special emphasis in the Human form and took advanced courses in both figure drawing, painting, and sculpture. This unique training in the visual arts has complemented his surgical expertise in plastic surgery to deliver a highly customized aesthetic result. Dr. Burton is committed to personalized attention and compassionate care.